Vanderbilt fans have bought 501 custom covers from Athlon. We still need to buy 499 more, or all those of us who pre-ordered are stuck with UT covers. I don't want that, you don't want that, no body wants that. So fork over the 9 bucks (that includes shipping and handling) and buy a piece of Commodore history. This offer is only good through Thursday, April 5th. I mean isn't this something that David Williams should do for the University? Buy the extra 500 copies necessary, send them to recruits, boosters (do we have boosters? ), egg-head professors and anyone else who wants them. This is one of those little marketing things that can help build the Football teams national profile. Plus I will be depressed if it shows up w/ god-dam Rocky-Top Orange on it. While I must encourage us to remember that this is a family website and we'd like to keep it as clean as possible, Douglas James makes a very good point. If Thursday rolls around and we haven't filled 1,000 orders, DW might be well advised to bite the bullet and buy us some pub. My understanding is that these magazines will only be sent to those who buy it online. They will not appear on the newsstand. From the website: "These covers are available ONLY through this web offer and are not available at newsstands. They will ship June 6, 2007." 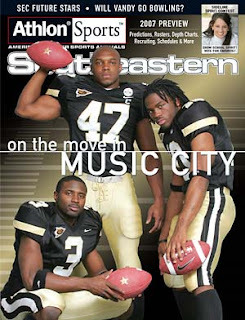 Still, I think the university, National Commodore Club, or Mrs. Ingram should pony up the cash to ensure there is a Vanderbilt cover on the Athlon College Football preview. With that said, I also think that Vanderbilt fans should make sure that that is not necessary. If Vanderbilt can quickly sell out of its allotment for the Sweet 16, cram 2,000 people into Vanderbilt Stadium for he Black and Gold Scrimmage, and have a website as insightful as VSL to cover Commodore Nation, then our fan base should be able to get us over the 1,000 mark. For those of you reading this who haven't bought your copy yet, you are on notice. We're too busy watching American Idol...it's the "disco" craze of the "Now" generation. And just like disco I hope people take all the American idol contestants cd's, terrible commercials and movies and blow them up in a stadium full of people and cause a riot in the process. We can only be so lucky.